All Saints is proud to be taking part in the There But Not There commemoration of the fallen of World War One this November. There But Not There is a nationwide project coordinated by the charity Remembered. They say: "There But Not There aims to place a representative figure for every name on local war memorials around the country, into their place of worship, their school, their workplace or wherever their absence was keenly felt. 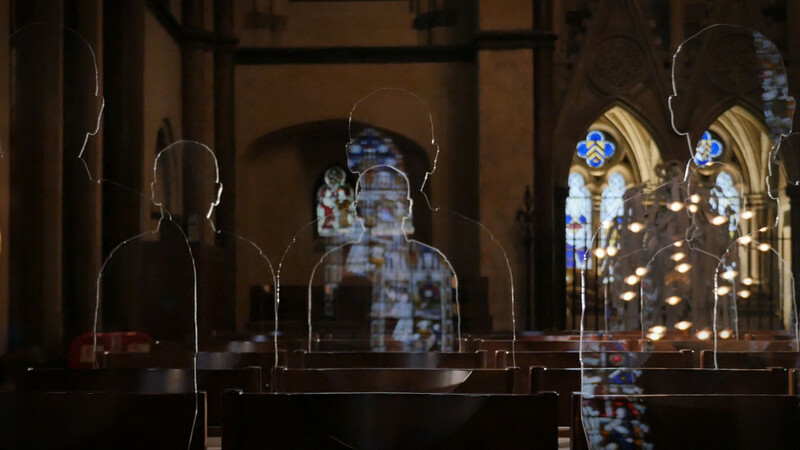 These transparent silhouettes will be back within their communities for Remembrance 2018, the centenary commemoration of the end of the 1914-1918 First World War." All Saints will hold a special service to mark the 100th anniversary of the end of WW1. The silhouettes from There But Not There will be placed in the pews. The service will be at 3.30pm on the afternoon of Remembrance Sunday (11 November) and will include an act of remembrance where the names of those who lost their lives in this conflict will be read. If you would like to honour one of Cheadle Hulme's fallen by purchasing a silhouette or support the project then please contact the Vicar of All Saints, Janet Bacon, by email or on 0161 485 3455.